In the Spring of 1967 Frank N. Mora III (Puerto Rico), Jeremy Pike (Australia), Nick Schoular (United Kingdom), and Geoff Tyers (United Kingdom) lead the effort to bring the sport of Rugby to Clemson University. During the first few years the team struggled through many years of hardships like most new teams working to increase membership, secure matches and develop coaching skills. Jeremy Pike had a contact to buy real shirts from Australia and the first set of jerseys purchased had horizontal stripes in navy blue and bottle green. Nothing significant about the colours it was all they had in stock! During the very first season in the Fall of 1967 the club several matches were played in Memorial Stadium. Two football players joined the team that year and enjoy exploring the sport of rugby. Unfortunately their promising rugby careers were cut short when the coaching staff of the football team discovered their participation! In 1971, the club secured a significant upset Victory Over Yale, the 1970 Ivy League Champions Who Were On A 19-Game Winning Streak. Through hard work and dedication Clemson Rugby soon became a major force in collegiate rugby. During the first half of the 1970's the club was one of only a handful in the South. As a result it lead to the team consistently competing against University of North Carolina, Charleston Rugby Club, N.C. State, Atlanta Old White and Medical College of Georgia. 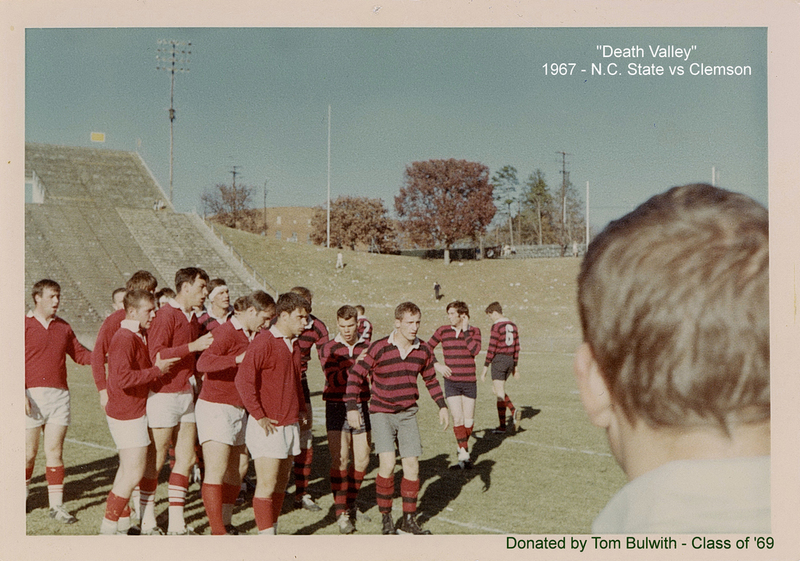 In 1973 Clemson rugby alumni Jim McMillan helped found the rugby team at the Medical College of Georgia. In 1972 the club took it's first international tour to the Bahamas. The club lost a very tight match to the Freeport Rugby Club due to a very questionable call by the referee in the last minute of the match. The Freeport rugby club at that time had never lost to a U.S. Team. The Clemson women's team originally got its start in 1976 when female fans wanted to create their own team, however the student government refused to recognize them. The men's team supported the women and helped them to create the Rugby Boosters Club, which truly was the university's first women's rugby team. The Rugby Booster Club was part of the men's club until the Spring of 1977, when the Women's was officially recognized by the university in an effort lead by Lesa Bethea, the club's first president. The Women's team continued successfully for 5 years until unfortunately it folded in 1982. In November of 1980 the team hosted the ACC rugby tournament in Clemson. After a series of challenging matches the team ended up facing the University of Virginia in the finals. The match was played in very cold and yet conditions, however Clemson emerged victorious! During the mid 80's the club continued to play full Spring and Fall schedules adding to the list of rival clubs, Belmont Abbey, Wake Forest, Olde Grey, Johnson City and the Citadel. A very memorable tour to Florida was made in the Spring of 1985, although no-one seems to remember the opponents or scores! In 1989, the club finished 12th in the country with an undefeated record for the Spring, making it to the quarterfinals of the Sweet Sixteen. One of the most notable matches of the Fall semester was beating LSU 12-6 to win the Eastern Rugby Union Group IV Playoffs at Tuscaloosa, Alabama. The 1990s were a time for change within the CURFC on the field. Former player Frank Graziano (Class of 1977) became involved with the team once again and instilled an idea of field dominance nationally. During Coach Graziano's time with the team, Clemson Rugby had managed to achieve several major accomplishments. Numbered among those achievements were Clemson's first undefeated season, Georgia Rugby Union champions, a number one ranking in the Southeast, and entrance into the Elite Eight where the Tigers matched up against Penn State after a first round victory over Cornell University. In 1992 Dr. Rich Saunders stepped down from the position of club advisor. Dr. Saunders was the club's advisor from 1978 until 1992. During that time Dr. Saunders, an avid photographer created a huge archive of photographs of the matches, fans and social events. It is his collection that forms a large section of the Foundation's photo archive. In 1995 the women's team was re-born through the efforts of Rachel Ferguson, Jaime Swierczeck, Frank Graziano and several others. The women's team has been an active club on campus since then. For the next 10 years the women's team remained competitive. Several of the men's club alumni have been head coach including Jim Gaine, Sean Simon and Vince Atkinson. Unfortunately since 2010 the women's club membership has struggled to maintain enough active players. In the CURFC's 30th year, 1997 and in the same school year of Coach Graziano's departure for a USA Rugby Collegiate Director position, the Tigers remained strong. Student coached the Tigers amazed many strong university teams throughout the south. A difficult Fall lead to a successful Spring semester in which the CURFC would again be in the national spotlight. In 1998 after defeating every southern team they faced, the Tigers boarded a plane for Houston, Texas and the Sweet Sixteen. There the Tigers gained the respect of many nationally ranked teams and coaches for pulling together and showing the determination to even make the trip. The team completed in two very physical matches against Dartmouth and Colorado State. Early in the summer of 2001 several alumni including Jim Gaine, Sean 'Stick' Simon and James 'Limey' Baxter formed the COBRAs (Clemson Old Boys Rugby Association) seven's team. COBRA was chosen as the team name to avoid confusion with the all alumni COB team, as the team was a combination of alumni and current undergraduate students. The COBRAs competed in several 7's tournaments that summer including Cape Fear at Wilmington, N.C. and Bele Chere at Asheville, N.C.. The Cobra's continued to enter 7's competitions on an annual basis through 2008 and made a trip to Memphis in 2011 to take part in the Elvis 7's tournament. In the Spring of 2003 the club took on our in-state rival, the University of South Carolina. The club outscored U.S.C. 45-7 in an impressive match in which the Tigers lead from the very first minute. With this win, it marked the tenth year in a row that the A-side defeated U.S.C! Clemson advanced to the round of 16 of the national playoffs for three consecutive years from 2005-2007. Clemson has played since 2011 in the Atlantic Coast Rugby League against its traditional ACC rivals. Clemson placed second in its conference in the spring 2012 season with a 6-1 conference record, narrowly missing out to Maryland for the conference title and a place in the national college rugby playoffs. Clemson again finished the spring 2013 season with a 6-1 conference record, and then defeated South Carolina 29-7 in the round of 16 national playoffs, before losing in the quarterfinals to Central Florida 20-24. Clemson Rugby has grown off the field as well. The Tigers have made several large strides in improving Clemson Rugby's organization. The team has set up an alumni fund to allow graduates to give back to the club. The annual alumni gathering at homecoming has become a highly anticipated event where former players and supporters are hosted at several events including a dinner, inter-collegiate rugby match, pre-football game tailgate, an alumni match against the college team, and a post match cookout which allows the past players to socialize with the present players and of course tell old war stories. The Clemson Rugby Foundation is a non-profit 501(c)(3) organization and was founded during the CURFC's 40th year in 2007. It has allowed the alumni and supporters a more organized way of supporting rugby at Clemson including the creation of several scholarships, coaching stipends and other grants. In August of 2015 the club hired Steve Lynch to become head coach after Coach Justin Hickey decided to step down to become director of athletics and activities at Moon Area School District in the Pittsburg PA area. By James 'Limey' Baxter, Class of 1998.